This a place for the JVP Community to Indulge in conversations about the surfboards we design and build together. Got a question, a comment, or a shout out? Leave it in the comment box below and I’ll get back to you! JP! Dude, my Threedom is insane! I’m glad that we decided to try two different size back fins in the single fin box. The smaller fin was insane for throwing the tail out, and the bigger fin was unreal for accelorated speed and drive. Man, I’m absolutely loving my new board! Thanks so much for the time you spent with me to design it, and the years of knowledge you brought to the table to make my surfing experience better! Thanks so much for the response JP! I’d love to learn more about troubleshooting fin choice, fin area, sweep, and rake. I’m not as versed as I would like to be, but I’m very interested to learn much more! This whole experience, getting a board for you is much more than just grabbing a board off the rack at a surf shop. I love learning about surfboards, surfing, history, and all the rest of the culture of surfing. Buying a surfboard from you has included all those facets, and that’s something a shop just can’t provide, in comparison to the one on one conversations I’ve got to have with a shaper. Thanks for having time and patience to answer my questions. You must be really passionate about this whole thing if you still love it all this much after all these years! I love the Shrimp model. I thought I was ordering a small wave board that i could only ride in wave under head high. little did I know that this board would ride the tube, hold a turn, and catch me a lot more waves in all kinds of fun diverse wave types. Love my four fin setup you dialed me into as well. Looking forward to coming back soon and ordering another board from you and continuing the conversation. After years of surfing various thrusters at Ventura and Santa Barbara point breaks, I was ready for a different feel under my feet. During my first session on a Viper, I knew I was riding something special. Two Vipers later, I’m still amazed at the number of sweet spots John has designed into this board. Vipers are fast, loose when you need them to be and they paddle. Yeah Bailey. Stoked you love your Shrimp. I am really high on this model. John and I worked a bunch on this model and all the elements eventually came together so well. I’m so proud of this model because it really is different than any other board out there and it works so well. I’ve ridden it as a thruster, 4 fin, 5 fin and the amazing thing is it works excellent in any fin configuration. I liked my little 5-7 so much I asked John to make me a bigger one, well, 5-11 and he’s just spun another gem and it will be ready in a bit. Can’t wait. Stoked to see your still at it! Its been a few years since the original “Ocean Rhythms” shop. Stay shaping brudda! JP, My 7’0″ Tribal Turtle ” flying egg “, Rocks!!! Just like you said, it Zooms ! Some of those drops at Rincon this past week were manageable with this new board. Thanks again bro! JP.. Stoked to see the Stubbie Disc added as a new model!! It was a real privilege to work on the design with you. Definitely a fusion between the past, and todays modern shortboards, or modern retro fusion, speed sled, anyway it’s no mini simmons, way faster and it turns.. Love the classic SB Stubbie shape with modern bottom contours, and would really like to try it as a single fin as well. At 5’10” I thought I’d like it mainly for waves in the waist to head high range but it has proved to rip in waves well overhead. Catches waves easy, and very fast! Anyway. Spot on. Thank you and I have a couple variations in mind for future projects – Don Jayne, 6’0″ 190lbs age 52. Hi JVP just checked out acouple of vipers here in Victoria..am tempted to get an 8’5″ at Zaks in Melbourne, love diamond tails I weigh 92 kilos and want to surf 6′ point breaks what do you think? JP! The New 5’10 Nose Rider that we created together is one of the best boards I’ve ever explored in my life. I’ve ridden now, over 400 boards in my life, and have a garage full of many more than I should admit. I have to say, this board is magic because you were able to see my dream and use your years of experience to not only shape what I have been trying to explain to so many other shapers who couldn’t grasp my ideals, but you were able to even become part of the board and add to it to make it better than I could have originally realized! I am so glad that we stayed such close friends and and worked together, now, on what is our 3rd board. The first two boards were your creations, and I loved them. This time, you told me it was my turn to be the dreamer, and you would mow the foam to make it happen. Well…boy you did that, and I couldn’t be more stoked on my surfing equipment for the point I am at in my surfing life today! Thanks for always listening to my dreams with care, adding your own flare, and creating masterpieces for me to enjoy my time in the ocean on. Explore shapes and design with an eye for detail, quality and craftsmanship. Quality without compromise. 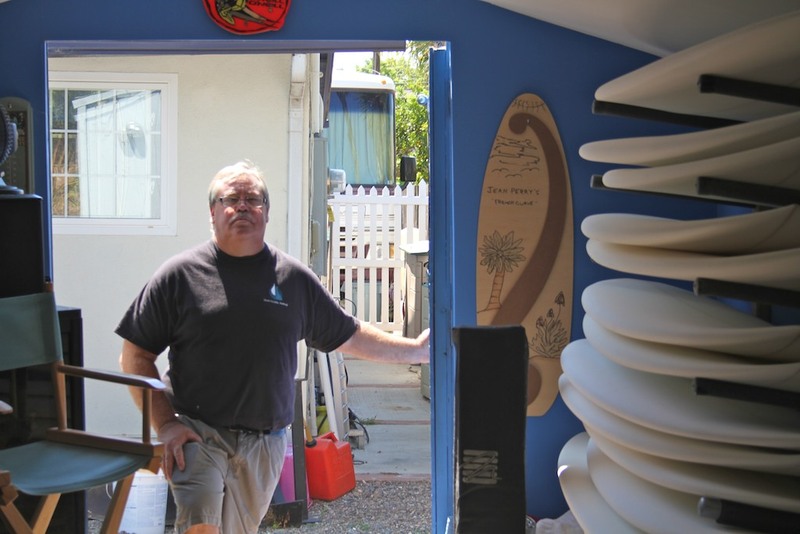 JVP Surfboards builds custom surfboards for all surfers. The love of surfing and shaping surfboards is what drives me to design, with you, your next "magic board!"